Media mogul Rupert Murdoch has been making the headlines himself recently by revealing plans to de-index his news websites from Google, when they start charging for access to online content. This follows a long running spat between media publishers and the world’s leading search engine. On the one hand, Google drives substantial traffic to news websites. However, publishers are frustrated by the editorial power that Google is able to wield through its Google News service – power that traditionally resided with publisher/newspaper. They also claim that Google is in breach of copyright by publishing news from their websites in its index. The counter-argument has always been that if newspaper sites are so annoyed by Google’s actions, then they should just block the search engine from indexing the site. Murdoch seems to finally be putting his money (or traffic) where his mouth is. Back in 2007, a group of Belgian newspapers successfully sued Google for copyright infringements. And now, Murdoch is hoping to get one over on Google by taking back the power in the battle for online news. 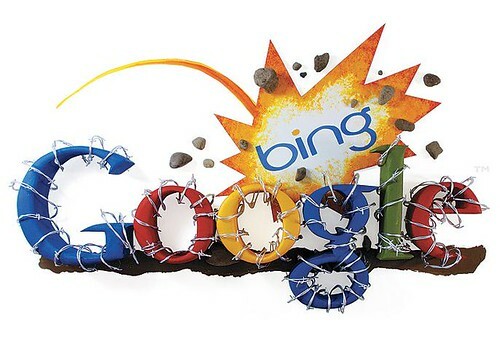 Recent reports have suggested that after removing news from Google, Murdoch will seek to secure a deal with new Microsoft search engine Bing. So how would this affect the balance of power in the search engine war? How do we search for news? If we imagine a situation where Bing managed to achieve exclusive access to most of the world’s major news feeds, it’s interesting to consider how that would affect the way we search for news and the way we use search engines in general. We are used to being able to access anything from any search engine, so would closing off content reduce our reliance on Google et al as the fount of all knowledge? Even if this did happen (and I think it would be hard for Bing to get ubiquitous control of the news space), Google has such a stranglehold on our online searching that, even if they lost the news battle, they would still be used for our everyday searching needs. That said, we could see a split in the search market, where if you wanted to search for news, then Bing would be the engine of choice, whereas for everyday surfing needs, Google would still retain its dominance. It’s safe to say that this battle is only just beginning; it’ll be interesting to see how it pans out.